I didn't think that poker games could be considered illegal, but I guess I don't know anything. 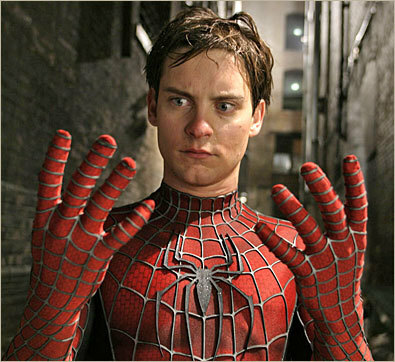 Tobey Maguire, along with other Hollywood celebs and rich folk, was involved in an illegal gambling ring where he won tons of dough. I guess the guy who set them up created a ponzi scheme to create the prize money...probably with the thought that he would end up winning (?) and lost to the likes of Tobey. Now the man behind the scheme, Bradley Ruderman, is now in jail and is trying to recover the money he stole from his investors by suing the winners of the games. Unfortunately for Tobey, he is a champ and it is suspected that he won around $10 million from 2006-2009, so he is the main target in this whole debacle. The amount he is being sued for is over $300,000 plus interest. I would never had suspected that Tobey was a mad poker genius. The other A-listers involved in the games include names such as Ben Affleck, Matt Damon, and Leonardo Dicaprio...but fortunately for them they are not as good as the Tobesterr. I think it is BS that this guy can sue for money that he stole...but I guess there is some California law that may make it possible for it to be legit. Lame.